Western blot of extracts from Raw264.7 cells, untreated or LPS-treated (1 µg/ml for 6 h), using Cox2 Antibody. 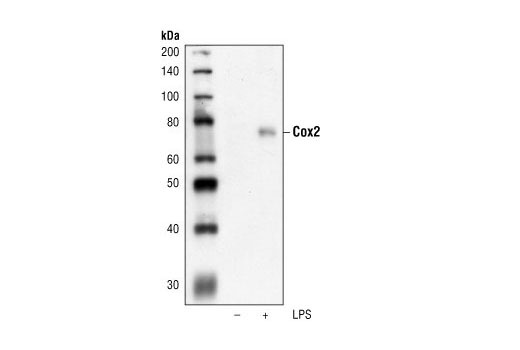 Western blot analysis of extracts from Raw264.7 cells, untreated or LPS-treated (1 μg/ml for 6 h), using Cox2 Antibody. 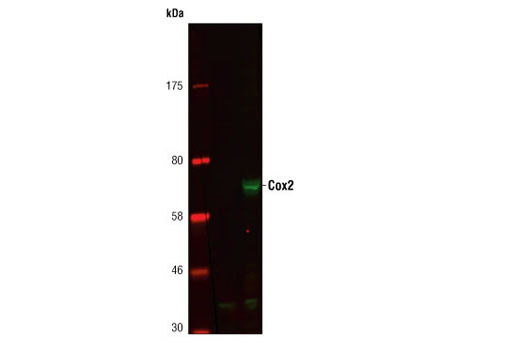 Cox2 Antibody detects endogenous levels of total Cox2 protein. Polyclonal antibodies are produced by immunizing animals with a synthetic peptide corresponding to the sequence of human Cox2. Antibodies are purified by protein A and peptide affinity chromatography.